EDINBURG — While the contribution was appreciated, a bigger plan is being discussed. The city of McAllen presented a check for $1 million to University of Texas Rio Grande Valley at its School of Medicine on Wednesday. 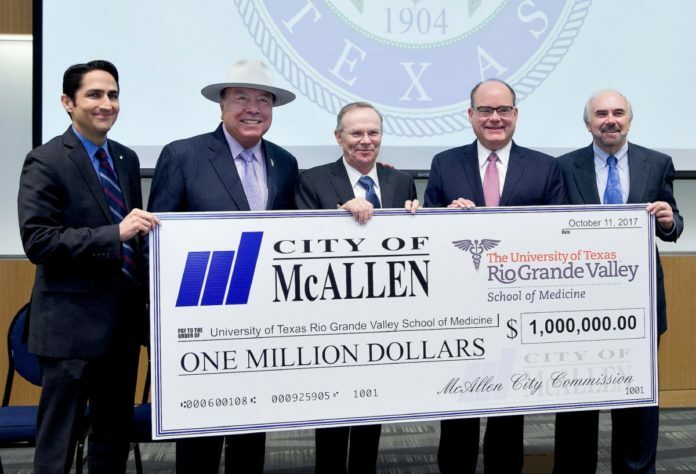 The city finally honored a commitment it had not made good on since 2014, which was paying the UTRGV School of Medicine “up to” $2 million per year. McAllen has dealt with “24 straight months of negative sales tax revenues,” Mayor Jim Darling said after the presentation, which is why Darling said the city has not paid the school since 2014. UTRGV has dealt with budget problems of its own — state legislators in May granted the School of Medicine $54.1 million for the next two years, $7.2 million less than the previous biennium. As the newly created school takes shape, officials said funding is critical. State Sen. Juan “Chuy” Hinojosa said after Wednesday’s presentation that he and Darling have met multiple times regarding a new proposition, potentially on the November 2018 ballot, Darling said. The proposition would be to create a “medical school district,” Darling said. Every county in the state that has a medical school also has some sort of health service district to help with funding, Darling and Hinojosa said. Health service district proposals have gone to Hidalgo County voters twice in recent years, and both failed resoundingly. The recent proposed district in 2016 would have collected a new property tax and spent that money on medical services for the county’s poorest residents, as well as partially funding UTRGV’s School of Medicine and support community clinics. But this time, if it indeed ends up going on a ballot in the coming year, Darling and Hinojosa would want it to strictly be for the medical school and to not raise county property taxes. In order to get rid of the 8 percent rule, Hinojosa floated the prospect of a constitutional amendment to make this idea possible. Does Hinojosa think this idea, including the constitutional amendment, is realistic? Property taxes are too high, Hinojosa added. “But keep in mind,” he said. “The reason property taxes are so high is because the state continues to abuse funding for public schools. Every time we lose a share of funding for public schools, the local government taxes in the school district have to be increased to cover the difference. Therein lies the problem for Hinojosa, Darling and the supporters of creating a health service district, especially as voters so strongly rejected the previous two efforts. What will be different this time? “I certainly would reach out to some of the people who led the campaign against the district and have their input,” Hinojosa said. “So they can see what we’re doing and not increasing property taxes, and that this is for the betterment of the Valley.